You’ve made the decision to buy a home -- congrats! For the past few months you’ve been looking at homes online, scrolling through pictures and stopping to look closer each time you'd see a home feature that you liked. You may have created a Pinterest board with all of your wish list items for your ideal home. After months of doing this, you’ve finally decided that now is the time to buy a house. The weekend comes around and you think to yourself, “I want to look at houses today!”. If you don’t already know a Real Estate Agent that you like and trust, you might decide to call one from a house that you saw online. When you reach the agent you say, “I want to look at this house today”. The next thing the agent does will completely burst your bubble. The agent will start asking you questions to know if you have been pre-approved to buy a house and for what amount. They'll ask questions about the type of house you are looking for, the size house you need, the location you want and other questions to learn more about your needs. A few minutes into the conversation you’re probably thinking to yourself, “why is this agent asking all these questions? I just want to look at the house!”. Now I know that looking at houses is fun and exciting once you’ve made the decision to buy a house, but let me give you 4 reasons why a home buyer’s consultation is an important step before looking at houses. This is when communication is so important. Getting to know you, your wants and needs is crucial in helping you find the home that is right for you. This step is especially important if you are relocating to a new area. Sure homes may look nice online, but where are they located? Are they in an area that will best fit your lifestyle? Do you need to be in a location that’s an easy commute to work? Do you have young children or are you an empty nester? Do you have any pets? Do you want new construction or do you enjoy the challenge of a fixer upper? All these questions are a way for your real estate agent to listen and learn about you and your needs so that we can best help you find a home that you will love. If this is your first time buying a home or if it’s been years since you’ve bought your last home, the consultation is where your agent will explain in detail about the home buying process. Your agent will answer any questions or concerns you may have to put your mind at ease. It’s also a time where your agent can learn about your expectations, and how best to communicate with you -- do you prefer email, phone call or text? Real Estate Agents know their local market, they are out looking at homes everyday. They are either showing homes, touring homes, or previewing homes. After learning about your wants and needs, your agent can then show you homes in the MLS system that best match your criteria. Together you can then schedule a time to view any of the houses that you like. The agent will also create a personalized home search for you that will automatically send you any new home listings once they hit the market that match your criteria. This will probably be the scariest part of the consultation, only if you’re not familiar with why the Buyer’s Agent Agreement is important. 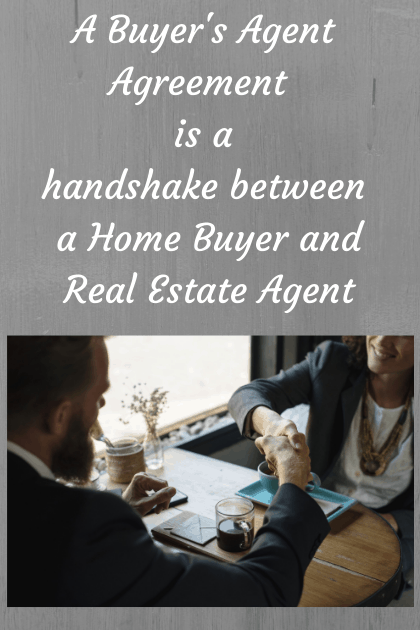 The Buyer's Agent Agreement is simply a handshake between a homebuyer and real estate agent. The agreement benefits you in that the agent will locate homes that match your criteria, advise you on pricing, negotiate on your behalf, schedule inspections, and keep all information that you give them confidential. At this point of the consultation you will know if you can trust the agent to work on your behalf, and in all fairness the agent asks that you work solely with him/her. If at any time you feel a disconnect with your agent, first talk to your agent about your concerns, if after talking with your agent you still have the same concerns, then the agreement can be mutually broken. I hope that you now have a better understanding of the important step of a home buyer consultation. The consultation will ensure that your real estate agent will help find you a home that you love, in an area that you love, for as long as you live in the home. This Real Estate article "4 Reasons for a Not-So-Scary Home Buyer’s Consultation" was written by: Maria Mastrolonardo. Maria is a Realtor with RE/MAX of Naperville, who has been selling Homes in the West Chicagoland area including Naperville, Wheaton, Lisle, Downers Grove, Aurora, and Winfield for 20+ years. Need help buying or selling a home? Call or Text Maria at (630) 248-6077 or email her at mmastrolonardo@gmail.com.